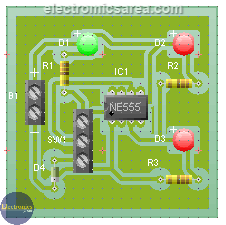 This 555 IC tester circuit, allows us to make sure that this integrated circuit works properly. This same test can be achieved by operating the 555 as astable multivibrator, but this test does not allow to observe its operation in detail. The suggested manual procedure clearly shows how the 555 IC works. How does the IC 555 tester circuit work? 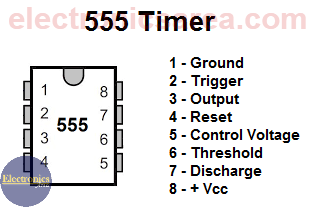 To achieve this, it is necessary that we obtain the correct low or high voltage levels at the output of the 555 IC (pin 3), when a high or low voltage is applied to the trigger input of the 555 timer (pin 2). To indicate when pin 2 is in low state and 555 was triggered, LED D1 turns on. When the 555 is triggered (pin 2 has “0” volts), the output (pin 3) will be high, LED D3 will turn on and LED D2 will be off. When the 555 is not triggered (pin 2 is Vcc (Bat)), its output (pin 3) will be low, LED D2 will turn on and LED D3 will be off. If for some reason the previous steps are not met, then the 555 is damaged. 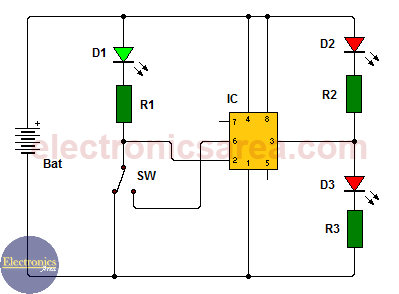 is used to discharge a capacitor that is not used in this circuit. 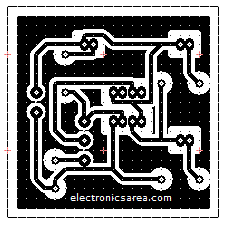 Below is a printed circuit Board (PCB) for the 555 IC tester circuit. The image on the left gives an idea of the final appearance of the PCB and the image on the right shows the copper side of the printed circuit board.